We just got the lab results---we can take our baby off the box TODAY! I had a moment to enjoy the beautiful weather with Andrew. 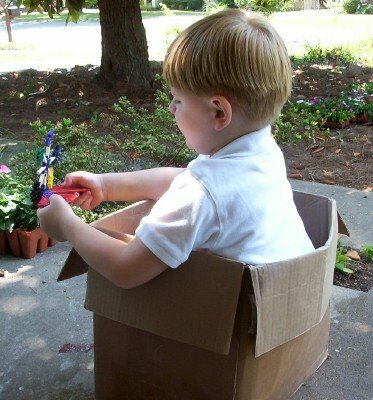 He's been busy updating his handheld "video game" into an interactive version (the cardboard box). In case you can't tell, one shoots crocodiles with laser beams while floating down the river. I don't know which is more pitiful: that this imaginative play apes a video game version of imaginative play, or, that even though it's imaginary, Mom still can't manage to operate the controls right. No worries about Andrew's creativity! What a cool kid. So glad Elise can get out of the bili...now, out to the real sunshine! Yay for being done with the bili lights! My son makes paper gameboys and tvs all the time. Its as close as he's going to come to having his own of either one. Hurray hurray hurray! for Andrew & Elise! What good news. The picture is one that will make you smile when your son is all grown up! Ha ha about the controls. He is such a cutie.